We all want to work in a team that is successful, don’t we? Hopefully your answer is yes. Working as part of a great team gives us a positive buzz, a sense of belonging and motivates us to do our jobs to the best of our ability. In doing so, it supports our team in achieving the success it deserves. Sadly however, a lot of money and time is wasted by teams who do not invest in the right sort of team-building. Thinking that a “bit of fun” will have a marked difference on individual and team performance is so far from the truth. Whilst some of the team may enjoy such an event, some won’t and the feedback will be mixed and any benefits will be short lived. I speak from personal experience, when I lead my first team, many years ago, a lesson I will never forget. Great teams don’t magically happen, they develop into great teams by investing quality time away from their day to day roles. They spend time on developing positive and collaborative relationships between each other. They spend time on understanding how effectively they are working together and what they need to change to become even more successful. So what can you do, to ensure that your team-building makes a positive difference and gives you a long-lasting return on your investment? Early on in my career, I heard a leader say that “In business, data is king.” How true. If we can measure the effectiveness and engagement of how our team operates, we can understand what’s going right and what’s going wrong. Teams invariably measure deadlines, costs, quality, timescales, budgets, risks and resources. Herein lies the problem. In a lot of cases, teams do not measure or understand those individuals that make up the team or the effectiveness of how those individuals work together collectively. 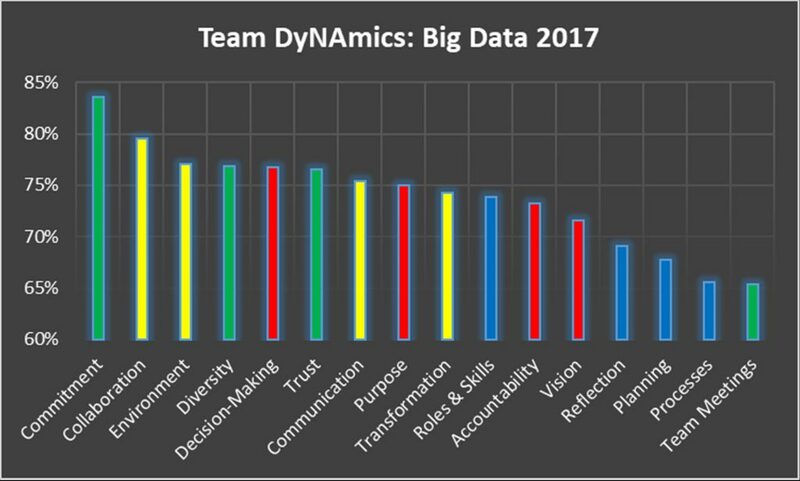 In 2014, I created and launched a Team DyNAmics Model, that does just that. 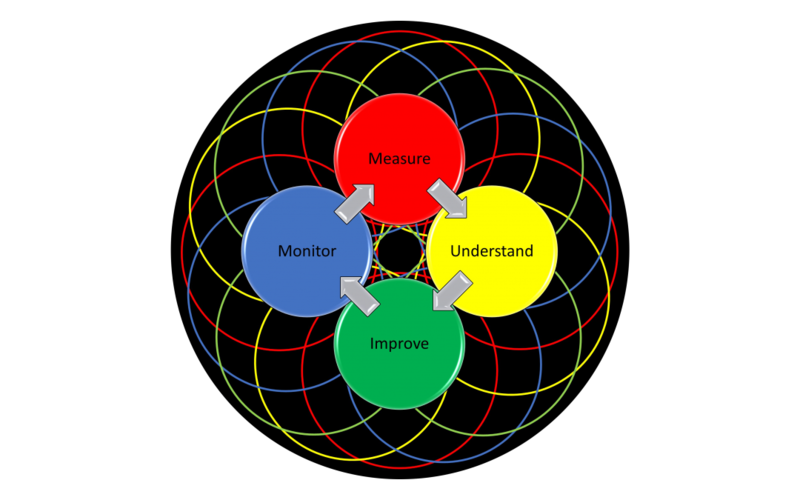 It helps teams to understand what is working well and what they need to focus on. How can you expect your team to succeed, if you don’t know who is in your team? You need to not only know their technical skills, what they are proficient at doing but also their behavioural skills, which will have an impact on the strengths/value they bring to the team, their communication style, how they make decisions and their challenges. Using a highly-regarded personality profiling tool will enable you to achieve this. 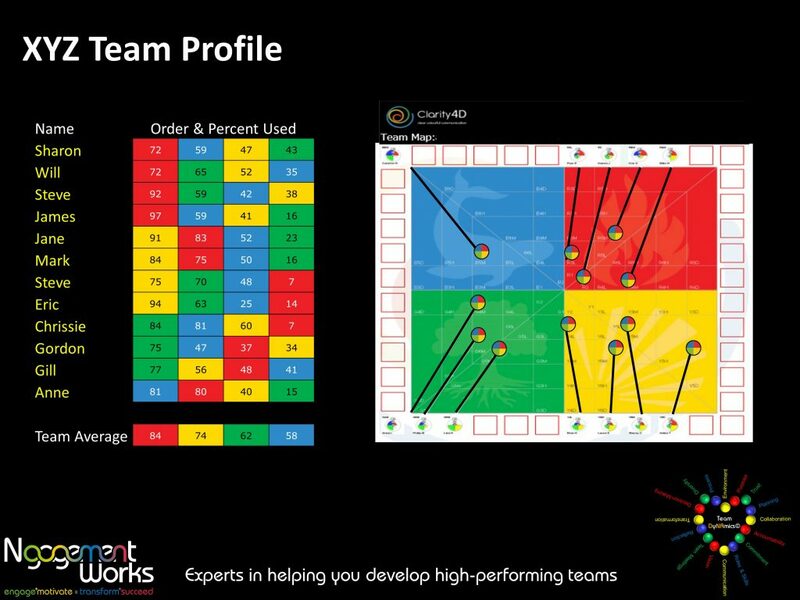 In addition, it will help you understand the team as a whole and provide you with vital information on how the group is likely to make decisions, generate ideas and how to maximise communication effectiveness between individuals and in group situations. The former is influenced by the psychologically preferences that Carl Jung termed Thinking and Feeling (how we make decisions) and the latter by Jung’s attitudinal functions of Introversion and Extraversion (which impacts on communication). Before you invest in team-building, you need to have clarity on what you want to focus on, why this is important and what changes you want to see. For instance, if your team-building involves making structures out of spaghetti and marshmallows, or building rafts or climbing trees, you need to be clear at the outset as to what business issues these experiences will help you overcome and ensure the team understand this as well. If you aren’t clear, the return on your investment will be greatly diminished and this will have a limited positive impact. In addition to clarity on the objectives of the team-building you undertake, you should also be defining what success looks like and how this can be measured to ensure it is achieved. The most important element that needs to be addressed if you want to achieve high-performance is Team Purpose. At a top level, everyone in the team should know why your team exists, what this enables and the benefits. 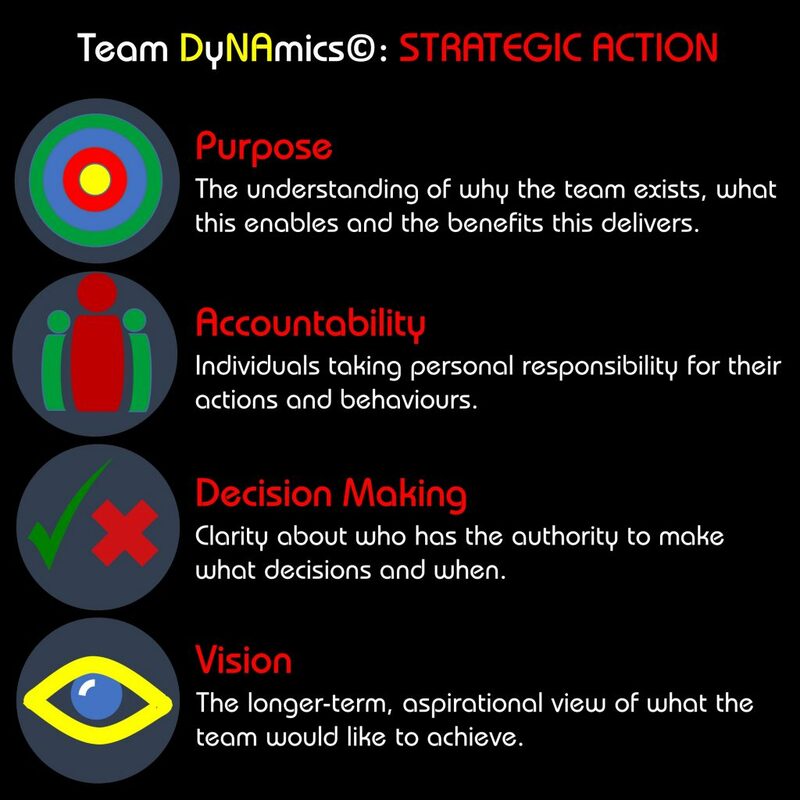 Teams that have achieved clarity and agreement on their Team Purpose, have a much higher Engagement Score than those where it scores lower down the 16 elements of the Team DyNAmics Model. Trust is the second most important element in the Team DyNAmics© Model. Trust takes time to nurture and you should provide opportunities for this to happen on a regular basis when your team meet. At your next team meeting, get everyone to share an unusual fact about themselves that other team members may not know or get everyone to write down the name of every other team member and then get them to speak to everyone and find a common connection with each one. There are many activities you can undertake to build Trust however these are a couple that are effective and simple to implement. It is important that everyone in the team takes ownership and responsibility for discussing issues, generating ideas to overcome these issues and then implementing them. Collective ownership of both the issues and the solution further helps to strengthen the emotional bonds between team members. Whilst it is important to get some quick wins in how the team operates to generate momentum and positivity, long-term success will not happen overnight. High-performance in teams is only achieved through regular review of how the team operates and continued tweaking of your strategy. So, in conclusion, if you want to increase the chances of team success and develop a high-performing team, you need to invest in understanding who is in your team, undertaking team-building that helps you and your team overcome business issues and agree on measures that will help you know when success has been achieved . If you don’t, you could end up wasting a lot of time and money for little positive return. Wishing you continued happiness and success in both work and life. Can I Help You And Your Team Achieve Greater Success or Speak At Your Conference?